Aughakillymaude’s Mummers Centre boasts an intricate display of detailed mumming sculptures of Ireland and abroad that recite nonsensical mumming rhymes, a photographic exhibition on mumming, a wickerman effigy and video documentary on mumming bonfire rituals. Groups/Schools can participate in straw craft and mask making workshops. The mummer is a menapian mummer in traditional garb. The character he represents is ‘Jack Straw’, the personification of straw. 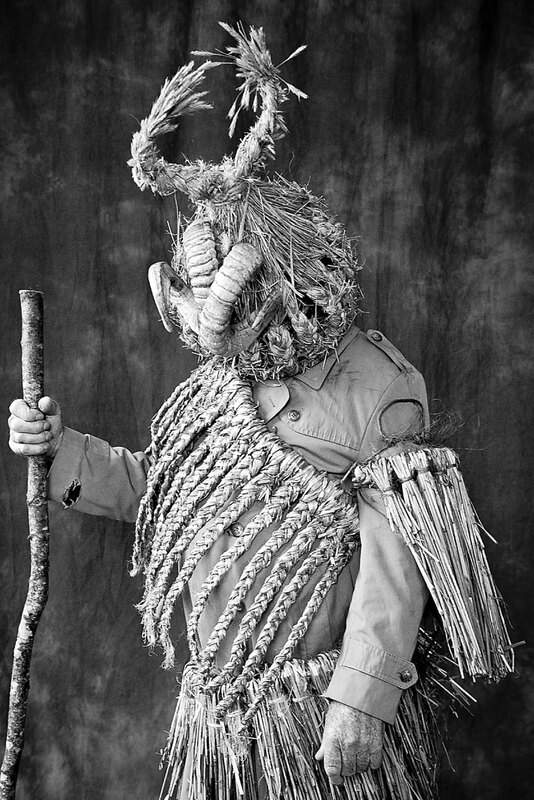 The figure wears a semi-plaited conical straw hat made from oat straw, a plaited straw jacket worn as a bandoleer to ease movement of the body whilst enacting the folk drama of mumming. The arm plaiting and loose unplaited straw skirt gives off a “swish noise” when moving.